We use extensive radar measurements of F region vertical plasma drifts and auroral electrojet indices to determine the storm time dependence of equatorial zonal electric fields. These disturbance drifts result from the prompt penetration of high latitude electric fields and from the dynamo action of storm time winds which produce largest perturbations a few hours after the onset of magnetic activity. The signatures of the equatorial disturbance electric fields change significantly depending on the relative contributions of these two components. The prompt electric field responses, with lifetimes of about one hour, are in excellent agreement with results from global convection models. The electric fields generated by storm time winds have longer lifetimes, amplitudes proportional to the energy input into the high latitude ionosphere, and a daily variation which follows closely the disturbance dynamo pattern of Blanc and Richmond . 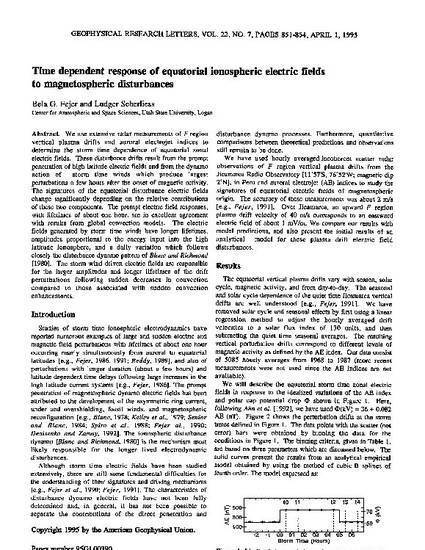 The storm wind driven electric fields are responsible for the larger amplitudes and longer lifetimes of the drift perturbations following sudden decreases in convection compared to those associated with sudden convection enhancements.